USD pairs faced bearish patterns due to the USD weakness caused by Yellen’s speech. USDCHF has been moving with bearish bias after the previous high at 0.99560. 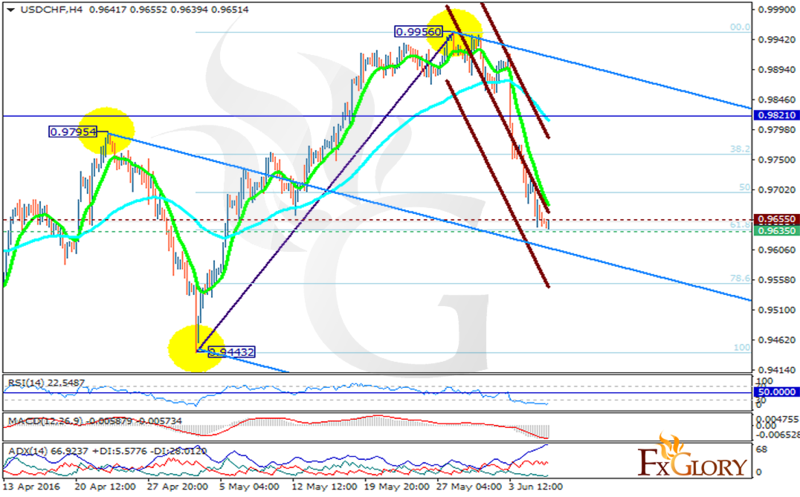 Now the support rests at 0.96350 with resistance at 0.96550 which both lines are below the weekly pivot point at 0.98210. The EMA of 10 is falling down the descendant channel and has passed the EMA of 75. All indicators are signaling price decline, the RSI is moving in oversold area, the MACD indicator is in negative territory and the ADX is showing strong sellers. However, the price is getting closer to the 61.8 of Fibonacci retracement therefore there might be a retracement at any time. In terms of support level breakthrough the pair will decrease to 0.9590 and on the other hand the resistance level breakout will push the price to higher ranges targeting 0.9750.